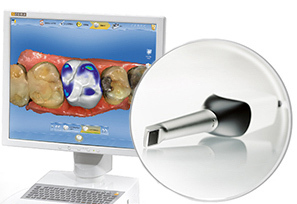 CEREC is an advanced process first developed at Zurich University and in use in dental practices since 1985. The process involves taking an image of the cavity to be restored and then, using Computer Aided Design and Manufacturing (otherwise known as CAD / CAM), producing a crown to restore the tooth. This method is used instead of a conventional filling or where there is not enough healthy tooth remaining to use a conventional filling. The final result is a highly aesthetic and very strong ceramic crown, bonded to the remaining part of the healthy tooth and precisely manufactured to restore the look and full chewing ability of the damaged tooth. How does the CEREC process work ? Having discussed treatment options with you in detail, we prepare the tooth in the same way we would for a standard restoration, by removing decayed tissue or a previous defective filling. Once the tooth is prepared, a CEREC crown or restoration is manufactured right here in the surgery before being securely bonded to the healthy part of the tooth. What are the benefits of CEREC tooth restoration treatment ? The CEREC 3D camera scans the prepared tooth in just a few seconds. This eliminates the need for unpleasant silicone impressions. CEREC restorations are milled out of a single ceramic block in a few minutes. They are then ready to be placed immediately so you don’t need a temporary filling or crown. Because your CEREC restoration is machined on the premises and ready to be placed immediately, the whole procedure is carried out in a single appointment without the need to wait until a crown is ready.